EDITED AT 13:42: All movie passes have been redeemed. Would you like to watch ‘The Hunger Games’ and ‘The Hunger Games: Catching Fire’ on 20 November 2013 ahead of the 21st November release in Cathay Cineplex’s Platinum Movie Suites for free? 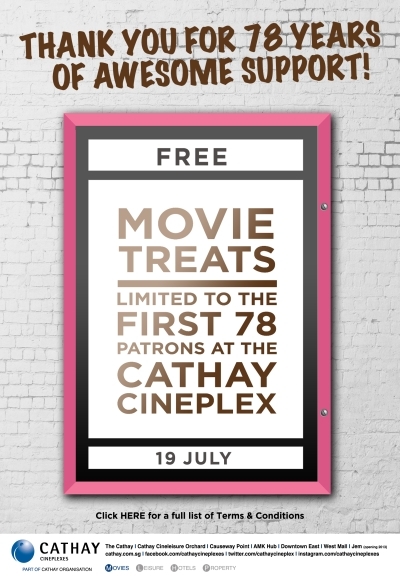 Cathay Cineplex is celebrating their 78th Anniversary and they are rewarding first 78th patrons at 78 patrons at The Cathay Cineplex. Full terms and conditions below. • Offer is valid only on Friday, 19 July 2013. • To redeem for this offer, simply purchase a full-priced movie ticket and say the catch phrase (EVERY REVOLUTION BEGINS WITH A SPARK) at The Cathay Cineplex, box office level 1. • Queue tags will be distributed on 19 July 2013, at 9.30am, only at The Cathay Cineplex, box office level 1. Redemption will commence at 10am. Please do not leave the queue after you have received your tag as that would mean you have chosen to forfeit your place. • Offer is limited to the first 78 redemptions; limited to one complimentary movie pass redemption per customer. • All complimentary movie passes are available strictly while stocks last and are issued on a first-come-first-serve basis at the box office only. • Complimentary movie passes are valid for use only on Wednesday, 20 Nov 2013, for movie screenings of ‘The Hunger Games’ followed by ‘The Hunger Games: Catching Fire’ at the Platinum Movie Suites, The Cathay, Cineleisure Orchard or JEM (screening venue will be pre-determined by Cathay). Seats are subject to availability and are issued on a first-come-first-serve basis at the box office. Other terms apply for the movie passes; please see details on the movie passes redeemed. • Complimentary movie passes are not exchangeable for cash or other items. • Offer cannot be used in conjunction with other promotions, discounts and privileges. • The management reserves the right to amend the terms and conditions of this offer without prior notice. • All information stipulated is correct at the time of print/post and is subject to change without prior notice. Hurry down to The Cathay Cineplex now! If you have been wanting to learn how to write science fiction stories like The Hunger Games trilogies or fantasy stories, here’s your chance! Calling budding writers and fans of Science Fiction and Fantasy! If you are a fan of writers such as Neil Gaiman, Jim Butcher, Time Powers, and Simon R. Green, then this 4-part workshop is for you. Organized by Eugene Tay from Monsters Under the Bed. Main trainer will be Adan Jimenez (co-author of Sherlock Sam series). Workshop will be held once a month on a Thursday evening. Participants who are interested to join us for this workshop must submit their story idea or an excerpt of their story of 2,000 words or less. Limited to 15 participants aged 13-28 years. Please register with Pearly at pearly_ma@nlb.gov.sg. You can also find the Facebook event for the first session of this 4-part writing workshop here. 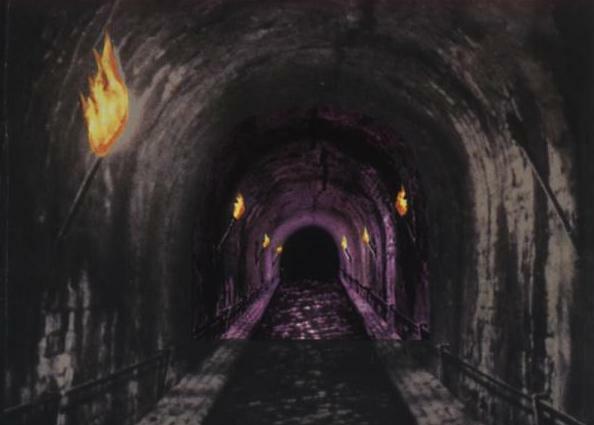 Wait no more Tributes! We have managed to get in contact with Cathay-Keris Films, the local film distributor for ‘The Hunger Games’ film franchise and we have a tentative release date for ‘The Hunger Games: Catching Fire’. ‘The Hunger Games: Catching Fire’ is currently scheduled to be release on 22 November 2013 in Singapore which is the same date as USA. Before you mark the date on your calendar, please do keep in mind that this date is subjected to change as a lot of things can happen during this period. 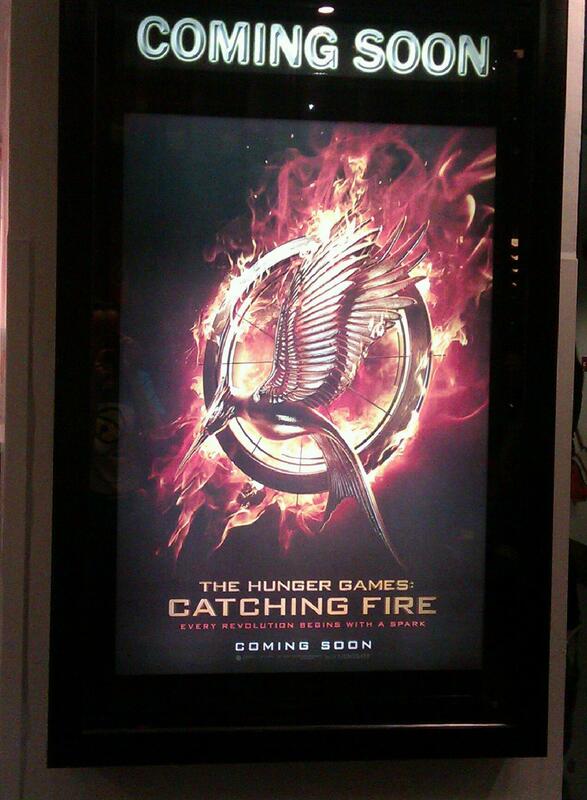 Nonetheless, stay with us at Hunger Games Singapore and we will be sure to keep you updated if we hear anything new! 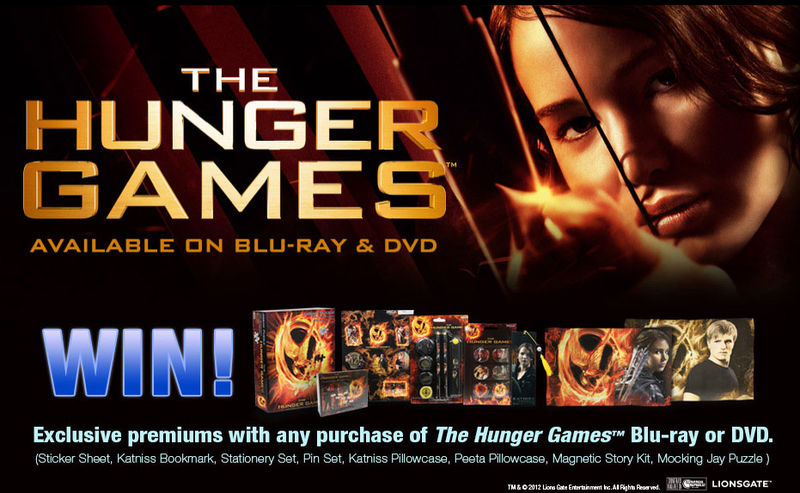 Win The Hunger Games Premiums With Purchase of The Hunger Games DVD/Blu-Ray! If you haven’t gotten your hands on a copy of The Hunger Games DVD or Blu-Ray yet, here’s one more reason you should. Besides getting to watch The Hunger Games for as many times as you like in the comforts of your home and also go behind the scenes with The Hunger Games special features, you will stand a chance to win amazing The Hunger Games premiums. We are talking about The Hunger Games sticker sheet, Katniss bookmark, stationary set, pin set, Katniss pillowcase, Peeta pillowcase, magnetic story kit and Mockingjay puzzle produced by NECA. TO ENTER, send the following details and include “The Hunger Games Contest” in email subject to Contest@tsgroup.com.sg : Name, NRIC, birth date, email, contact number, home address, 8-digit Board of Film Censors’ Certificate Number (found at the back of Blu-ray/DVD) & How did you know about The Hunger Games DVD/BD release. All entries to reach TS Group by 30th September 2012. For terms and conditions, visit TS Group website for more details. Do mention Hunger Games Singapore in your email to TS Group if you have gotten to know about The Hunger Games DVD and Blu-ray release through us. We will be very grateful. Many thanks to Typhoon Creations for the tip. “The Hunger Games: Catching Fire” is scheduled for release on 22 November 2013 in USA. Don’t forget to follow us on Twitter (@HungerGamesSG) and Tumblr as well as ‘Like’ us on Facebook for the latest updates! Remember we posted The Hunger Games DVD and Blu-Ray might be released in Singapore on 18 August 2012, which is the same date as USA? We have received confirmation from Typhoon Creations, a subsidiary of TS Group, that The Hunger Games DVD and Blu-Ray will indeed be available on sale on 18 August 2012 in Singapore. The special features in Singapore edition of The Hunger Games DVD and Blu-Ray will be the same as the USA edition. 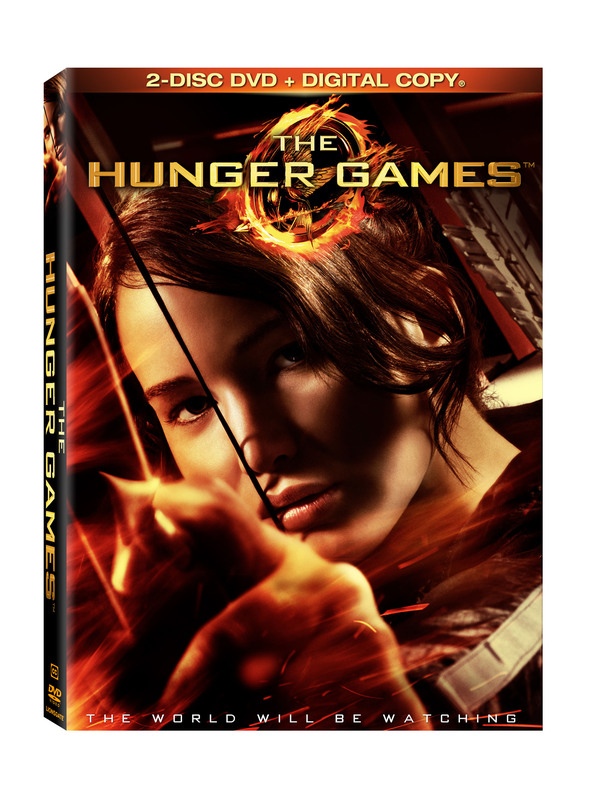 The Hunger Games DVD will be retailing at S$26.90 and Blu-Ray™ at S$39.90 and the title is targeted to be released on 18 August 2012. For every pre-order of the DVD, a free Hunger Games notebook will be given. For every pre-order of the Blu-ray™, a free Hunger Games notebook and a Hunger Games premium (either Wrist Band or Mockingjay Bookmark) will be given. While stocks last! Lionsgate has also released The Hunger Games special features trailer and behind the scenes clip with Jennifer Lawrence on Katniss Everdeen. Full list of The Hunger Games special features can be found here though it is subjected to change. Will you be pre-ordering it? If so, will you be pre-ordering the DVD or Blu-Ray or both? 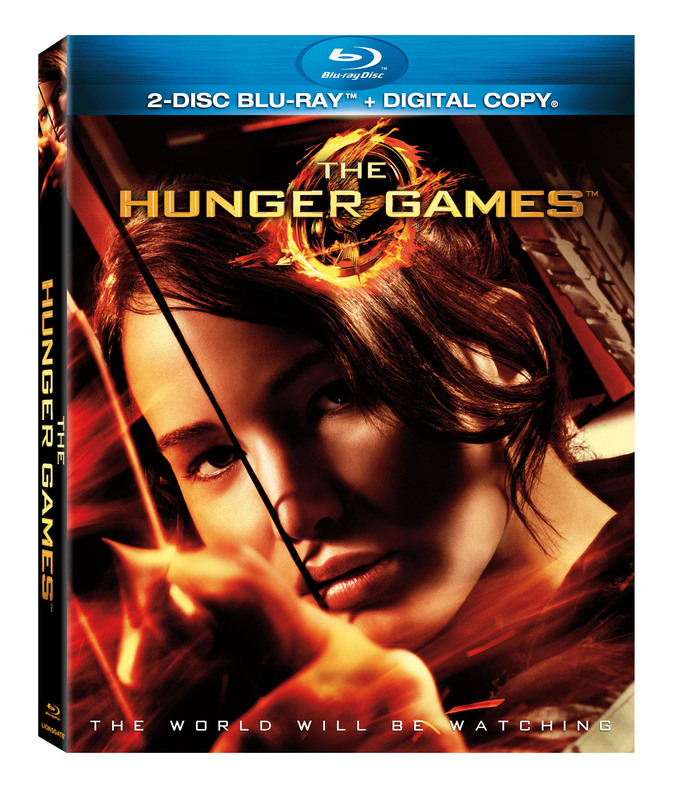 ‘The Hunger Games’, rated PG13, was released on 22 March 2012 and DVD and Blu-Ray pre-orders are now available. ‘The Hunger Games: Catching Fire’ is scheduled for release on 22 November 2013 in USA. The wait is over! We have just heard from Gramophone you can now pre-order The Hunger Games DVD and Blu-Ray online via Twitter. 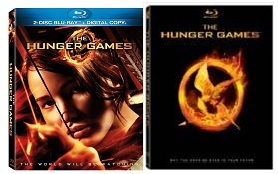 Blu-Ray version of The Hunger Games retails at S$39.90 while DVD version of The Hunger Games retails at S$26.90. The Hunger Games DVD comes with a free The Hunger Games notebook when you pre-order while The Hunger Games Blu-Ray comes along with a free The Hunger Games notebook and wristband OR Mockingjay bookmark. Both items are applicable for free shipping within Singapore on Gramophone and will be shipped out on the release date, 18 August 2012. Special features found in The Hunger Games DVD and Blu-Ray sold locally will be the same as the USA edition. Visit Gramophone for further information. Meanwhile, Typhoon Creations has stated they are in the midst of finalizing the details. Artworks, premiums, pricing etc. are subject to change but they are looking forward to start pre-orders in the next two weeks. We will update all of you once we hear anything new. If you see any other other retailers holding pre-orders too for The Hunger Games DVD and Blu-Ray. If you do see any other retailers holding pre-orders for The Hunger Games DVD and Blu-Ray, don’t hesitate to send us a tip via Twitter (@HungerGamesSG), Tumblr, ‘Like’ us on Facebook, or email us at HungerGamesSingapore@gmail.com! ‘The Hunger Games’, rated PG13, was released on 22 March 2012 and is now available in all cinemas islandwide. ‘The Hunger Games: Catching Fire’ is scheduled for release on 22 November 2013 in USA. 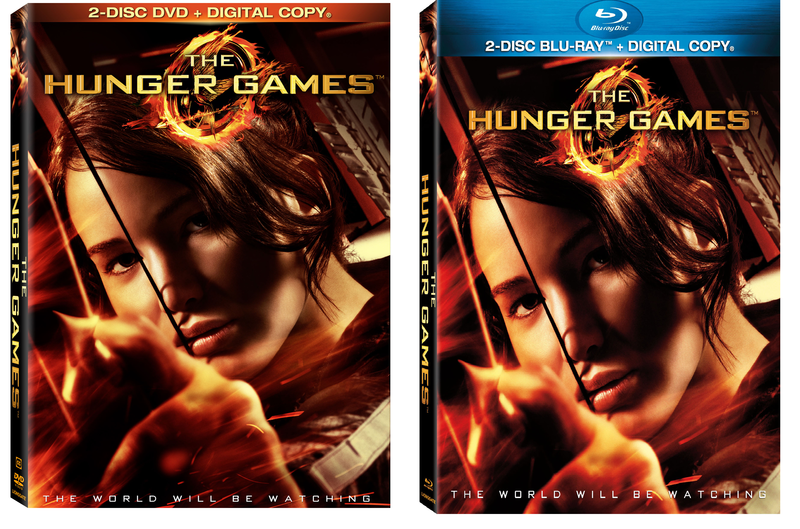 In May 2012, it was announced that The Hunger Games DVD and Blu-Ray will be released in USA on 18 August 2012. Months have past and there was no news on when The Hunger Games DVD/Blu-Ray will be available in Singapore. We have decided to reach out to Typhoon Creations, a subsidiary of TS Group. For those who are in the dark, TS Group is the distributor of The Hunger Games video formats in Singapore Typhoon Creations will be helping to market it. We learned from Typhoon Creations that they are “currently looking at August 18” this year for the release of The Hunger Games video formats in Singapore. However, please be reminded the release date is not set in the stone and could change. Meanwhile, they assured the special features will be the same as the USA release. If you can’t wait to get your hands on it, rejoice for they are planning to do a pre-order. We are told details such as pricing and formats are still being finalized but they should be able to reveal it during upcoming weeks. Will you be pre-ordering The Hunger Games so you can watch it again (and again and again)? We know we certainly are! If you have missed The Hunger Games Special Features trailer, check it out here! Keep checking back Hunger Games Singapore plus don’t forget to follow us on Twitter (@HungerGamesSG) and Tumblr as well as ‘Like’ us on Facebook for the latest updates! RIAA has annoucned “The Hunger Games: Songs From District 12 And Beyond” was certified gold on 27 April 2012 in USA! …Universal Republic soundtrack to popular post-apocalyptic film “The Hunger Games” each sold more than 500,000 copies to earn timely golden awards in April. It is incredibly hard to sell albums these days, especially with piracy going on, it’s certainly great to see “The Hunger Games” soundtrack does well in such hard times! Besides that, the collection of music in “The Hunger Games” soundtrack are the mainstream music many listen and it’s yet another feat it has managed to achieve to be able to be certified gold. 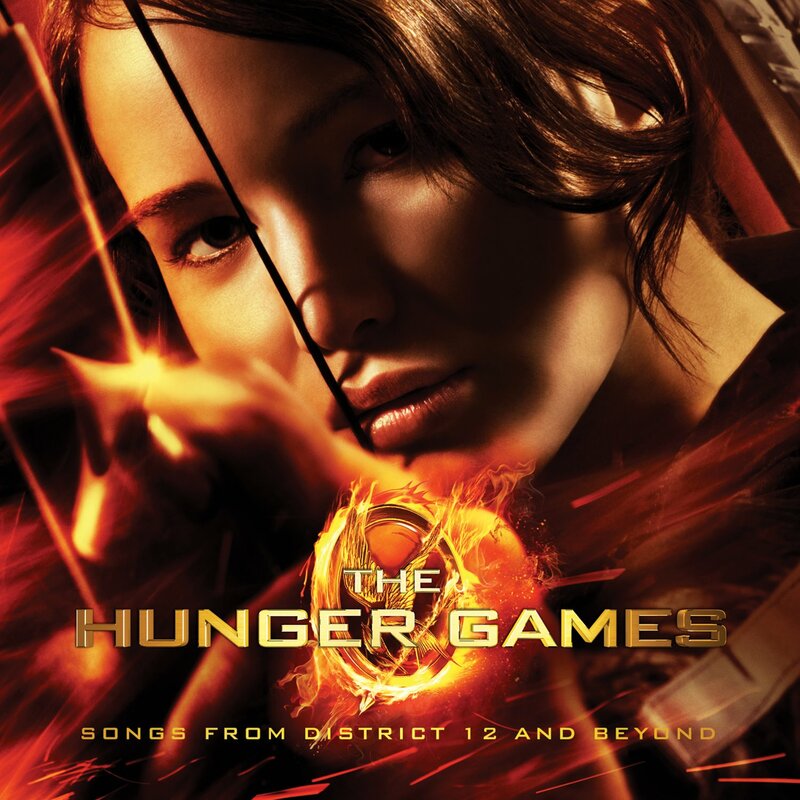 Do you love “The Hunger Games: Songs From District 12 And Beyond” soundtrack and/or “The Hunger Games” score album? Do show your love and support for those who poured their heart and soul into the albums by purchasing it! “The Hunger Games: Songs From District 12 And Beyond” soundtrack can be found in all major music stores such as but not limited to CD-RAMA, HMV and many others. Otherwise, you can also purchase “The Hunger Games: Songs From District 12 And Beyond” soundtrack and “The Hunger Games” score album from SingTel Amped, SingTel Music Store, M1 Music Store and Starhub Music Store. 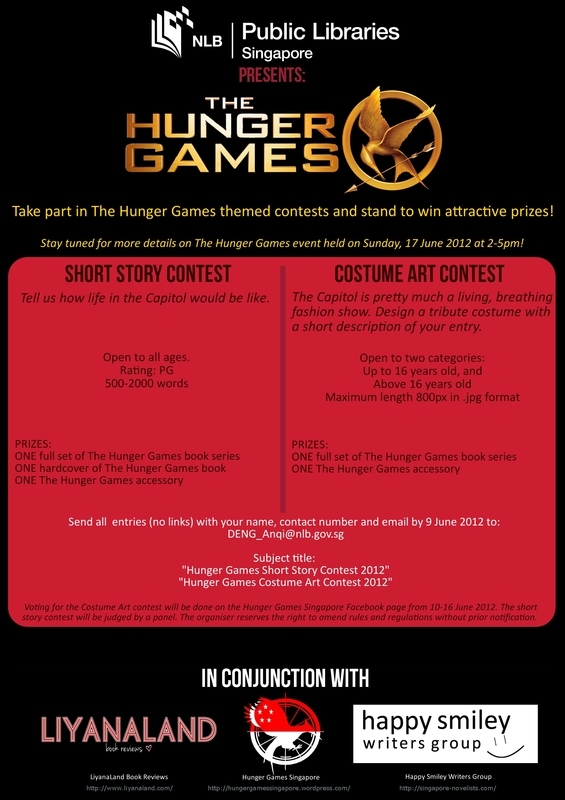 Check out ‘The Hunger Games’ short story contest, costume art contest and ‘The Hunger Games’ event! ‘The Hunger Games’ Short Story Contest, Costume Art Contest And Event! We have been hinting on something big we have never done before in store for YOU. After meetings and discussions, we are finally able to reveal this! We are proud to present ‘The Hunger Games’ short story contest, costume art contest and ‘The Hunger Games’ event organized by National Library Board, LiyanaLand Book Reviews, Hunger Games Singapore and Happy Smiley Writers Group! *Winner(s) must be present to collect the prize(s). Interact with other The Hunger Games franchise fans in Singapore! Test your knowledge and wits of The Hunger Games through fun games! Attractive The Hunger Games related prizes to be won! Prize presentation for winners of ‘The Hunger Games’ Short Story Contest and Costume Art Contest. Sale of ‘The Hunger Games’ trilogy and movie tie-ins at a much cheaper rate! ‘The Hunger Games’, rated PG13, was released on 22 March 2012 and is now available in all cinemas islandwide. 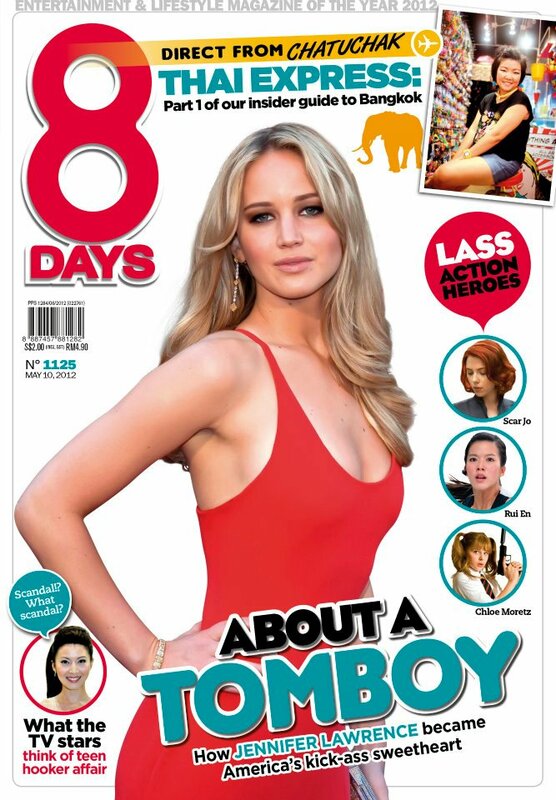 Jennifer Lawrence, who played Katniss Everdeen in ‘The Hunger Games’, graces the cover of 8 Days (#1125). This issue of 8 Days will hit newsstands this Sunday night at S$2 per copy.